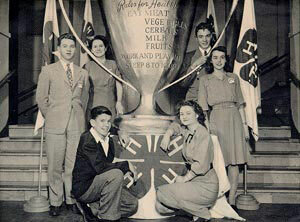 4-H, as we know it, began around 1900 as a means of reaching parents with improved farm and home practices. American farmers had experienced poor economic times for 30 years. It was risky business for them to try a newly recommended farm practice. In 1902, a few midwestern school teachers developed some crop demonstrations with their students who in turn shared their successes with their parents. These school projects developed small groups covering a single topic such as beef, corn, gardening, or canning. By 1909 some of these groups were called 3-H clubs, and in 1911 the name of 4-H was adopted. There were corn clubs in Wisconsin as early as 1904. The first county agents were hired about 1915 and the first Wisconsin State 4-H Leader was hired in 1914. A plan of organizing boys’ and girls’ agricultural clubs in Wisconsin was later adopted. This plan called for definite organization with the usual club officers, an adult leader, regular meetings, and a series of projects. Clubs were organized in schools and rural communities under the direction of the local teachers. Have 4-H objectives changed since its early days? Yes! Today the objective is the development of young people by providing a wide variety of learning opportunities in which all youth can participate. 4-H is for all youth, whether they live in the city or in the country. The national 4-H emblem is a four-leaf clover with the letter “H” on each leaf. The four H’s stand for Head, Heart, Hands, and Health. These four H’s represent the four-fold training and development in which members participate. This meaning of the four H’s is clearly given in the pledge below. 4-H members should learn the national 4-H pledge. I pledge my head to clearer thinking, my heart to greater loyalty, my hands to larger service, and my health to better living, for my club, my community, my country, and my world. Green and white are the 4-H colors. The white background of the flag symbolizes purity. The green 4-H emblem is nature’s most common color in the great outdoors, and green is the color of springtime, life, and youth. The national 4-H motto is “To Make the Best Better.” It should be the objective of every member and leader.